Abstract. As environmental conditions evolve with rapidly increasing atmospheric CO2, biological communities will change as species reorient their distributions, adapt, or alter their abundance. In the surface ocean, dissolved inorganic carbon (DIC) has been increasing over the past several decades as anthropogenic CO2 dissolves into seawater, causing acidification (decreases in pH and carbonate ion concentration). Calcifying phytoplankton, such as coccolithophores, are thought to be especially vulnerable to ocean acidification. How coccolithophores will respond to increasing carbon input has been a subject of much speculation and inspired numerous laboratory and mesocosm experiments, but how they are currently responding in situ is less well documented. 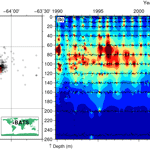 In this study, we use coccolithophore (haptophyte) pigment data collected at the Bermuda Atlantic Time-series Study (BATS) site together with satellite estimates (1998–2014) of surface chlorophyll and particulate inorganic carbon (PIC) as a proxy for coccolithophore abundance to show that coccolithophore populations in the North Atlantic subtropical gyre have been increasing significantly over the past 2 decades. Over 1990–2012, we observe a 37 % increase in euphotic zone-integrated coccolithophore pigment abundance at BATS, though we note that this is sensitive to the period being analyzed. We further demonstrate that variability in coccolithophore chlorophyll a here is positively correlated with variability in nitrate and DIC (and especially the bicarbonate ion) in the upper 30m of the water column. Previous studies have suggested that coccolithophore photosynthesis may benefit from increasing CO2, but calcification may eventually be hindered by low pHT (< 7.7). Given that DIC has been increasing at BATS by ∼ 1.4 µmol kg−1 yr−1 over the period of 1991–2012, we speculate that coccolithophore photosynthesis and perhaps calcification may have increased in response to anthropogenic CO2 input. How to cite: Krumhardt, K. M., Lovenduski, N. S., Freeman, N. M., and Bates, N. R.: Apparent increase in coccolithophore abundance in the subtropical North Atlantic from 1990 to 2014, Biogeosciences, 13, 1163-1177, https://doi.org/10.5194/bg-13-1163-2016, 2016.